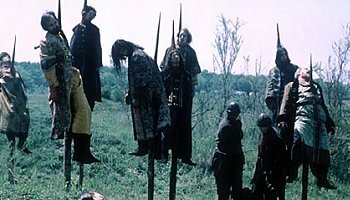 On this day in 1476, Vlad the Impaler - the historical figure that inspired Bram Stoker to create Dracula - defeats Basarab Laiota with the help of Stephen the Great and Stephen V Bathory and becomes the ruler of Wallachia for the third time. On this day in 1789, the first ever instance of nation-wide, federally-mandated "giving of thanks" takes place in the good ol' US-of-A. Ever since then, we've been celebrating the holiday of Thanksgiving, or, as our native friends refer to it: "Genocidal, Treaty-breaking, Smallpox-spreading Assholes Day!" On this day in 1825, at New York's Union College, Kappa Alpha - the first ever college fraternity - is founded. This seminal unveiling is soon followed by the first ever keg party and the first ever hazing-related death. On this day in 1922, in Egypt's Valley of the Kings, British archaeologists Howard Carter and Lord Carnarvon enter King Tutankhamen's tomb, becoming the first human beings to lay eyes on the Boy King in more than 3,000 years. Meanwhile, as Carter and Carnarvon breach the impregnable, halfway around the world, Stanley Applebaum is pulled, kicking and screaming, from his mother's bleeding loins. He would grow up to become Charles Schulz, beloved creator of the syndicated comic strip Peanuts. Coincidence? Don't make me laugh. On this day in 1965, in the Hammaguir launch facility in the Sahara Desert, France launches a Diamant-A rocket with its first satellite, Asterix-1 on board, making France the third country to enter outer space. On this day in 1977, an unidentified hijacker named Vrillon, claiming to be the representative of the 'Ashtar Galactic Command', takes over Britain's Southern Television for six minutes starting at 5:12 pm. On this day in 2000, Florida's Secretary of State Katherine Harris certifies George W. Bush the winner of Florida's electoral votes, despite the fact that he'd obviously lost the popular vote both in Florida and across the USA in total. On this day in 2004, a man stabs and kills eight people and seriously wounds another four in a school dormitory in Ruzhou, China. American 2nd Amendment absolutists rejoice over this bit of news because it proves that GUNS don't kill people... Chinamen with KNIVES do! On this day in 2004, the world's last black-faced honeycreeper dies of malaria at the Maui Bird Conservation Center in Hawaii before it had a chance to breed. The species is now extinct.